For most of us, landmines are not something that we keep in the forefront of our minds. 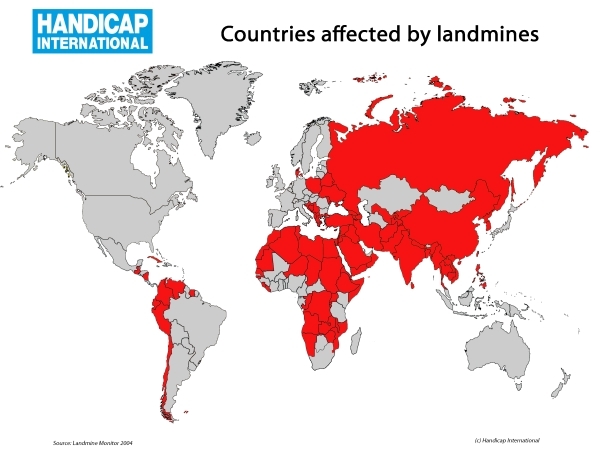 If you’re lucky enough to live in a developed country not directly affected by the horrors of war, then landmines are not a major problem you have to deal with on a daily basis. Unfortunately, that’s not the case for everyone. The fact of the matter is that there are over 60 countries in the world whose citizens literally have to worry about whether they’re going to blow themselves up by walking across a field, or a road, or really anywhere. Can you imagine, getting ready to cross the street, the “walk” light flashes on, and before you get to the middle of the crosswalk your life is over in a flash fire, smoke, and debris. It sounds ridiculous, but it happens every day. Ten times a day according to the latest statistics, and not just to soldiers. 79% of all mine related deaths or injuries occur to civilians. Why does this keep happening? Unfortunately, once these mines get placed, they’re more often than not just left where they sit. Even when the battle has moved on, underground mines remain, ready to detonate the moment an unsuspecting passerby walks too close. There is good news however, as there are hundreds of charitable organizations filled with members willing to risk their lives in order to clear the mines that were left behind. With the technology they’re currently using, they’d be able to clear all the mines in the world in about 1,100 years. Don’t worry, there’s even more good news. “The Mine Kafon Drone is an airborne demining system developed to clear all the land mines around the world in less than 10 years,” according to its Kickstarter page. It’s sounds like an exaggerated statement, until you see the MKD in action. The MKD was developed by Massoud Hassani, and if that name sounds familiar it’s because he developed another kind of demining drone a few years back, the Mine Kafon. The Mine Kafon actually started out as an art project, but it quickly gained recognition as a safe, effective, and relatively efficient means of clearing mine fields. The MKD takes this initial concept to an entirely new level. The MKD works using a three step process. First, the MKD flies over a large swath of land and, using an aerial 3D mapping system, determines all the dangerous areas within a predetermined set of GPS waypoints. Next, using a metal detector arm, the MKD pinpoints the exact location of buried land mines within that area. Because of the nature of drones, the MKD is never in any real danger of setting off the landmines accidentally. Finally, the MKD uses a robotic arm to place a small, timed detonator on top of the landmine and then flies away to a safe location before the detonator goes off, safely and effectively disposing of the land mine. The MKD is still in its development phase, but even so it’s been generating a lot of buzz in the drone community. This is a prime example of how drones can be used for good, and how technology in general can be used not to take lives, but to save them. Massoud Hassani grew up in Afghanistan, so he’s seen firsthand how land mines can kill, maim, and strike fear into people. Most of us – myself included – wouldn’t step foot out our front door if we suspected there might be a landmine in our front yard, but thousands of people across the globe have to do that every day, knowing that threat is real and seeing its effect on their community. With this in mind, it’s easy to see why so many people are supporting the MKD and hailing it as the future of demining technology. If you’d like to support this worthy project, you can visit the MKD’s Kickstarter page.